At the restaurant, we use several different varieties of clam – surf, venus and palourde, to name three. For this dish, you can use a mix or just one type, depending on what is on offer at the fish counter that day. Do wash them very, very well in plenty of water, as one piece of grit will spoil a feast with speed and malevolence. Take a sharp knife, open out each squid hood and score lines across from one side to the other, then turn 45 degrees and repeat to crosshatch the entire surface. Cut into thin slices, around 4mm wide, pat dry with kitchen paper and set aside. Trim the tentacles. In a generously sized pan, heat 2 tbsp mild olive oil. Add the sliced shallots, garlic and 4 tbsp chopped parsley, and fry gently for 2–3 minutes, until softened. Add the samphire, then cook for 1 minute. Toss in the clams and the white wine, up the heat and cook for a further 3-4 minutes, until the clams have opened. In the meantime, set a wide frying pan over a high heat. 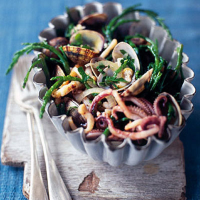 In a bowl, liberally season the sliced squid with freshly milled black pepper (hold back on salt because of the samphire) and add 60ml olive oil. Pour the remaining olive oil into the frying pan, then add the squid. Leave to fry undisturbed for a minute, then stir the squid well and tip into the clam pan. Squeeze the lemon juice over, sprinkle with the remaining parsley and stir with care, as clams have a habit of falling out of their shells once cooked. Samphire is a wonderful British ingredient and it would be remiss not to pair it with a locally produced wine; English wines have come on in leaps and bounds of late. Made predominantly from the sauvignon blanc-like bacchus grape, this is a widely available and deliciously perfumed wine. Chapel Down Flint Dry 2008 Kent, England. Bin 15592.